a legendary piece of german club culture and their music. Eponymous Resident DJ´s Klaus Stockhausen and the later on globally known Boris Dlugosch and Running Back take a close look back at that Time, guide you through the early beginnings and absolute key moments on (House Music) Club Culture. 37 (!) legendary Tracks — many of which have not been on sale forever and a day — that mark the masterclass sound of that Era and could be an essential start or — end — point to any great collection. In Addition , the — stunning — Mixing brings back the «Front» itself and must be heard by old and , most of all, new fans , all over. amburg’s Front club was already the stuff of legend, when it was still open. When I was teenager on the outskirts of Frankfurt in the very early nineties — and before the name Klaus Stockhausen rang a bell — Boris Dlugosch was not only at the helm of said club, but also one of Germany’s finest purveyors of house music. Front was his home as well as the playground for a colourful bunch of club kids from all walks of life. Its roots went back to the eighties as a gay club and it branched out to anyone who couldn’t — even dance straight ‘. 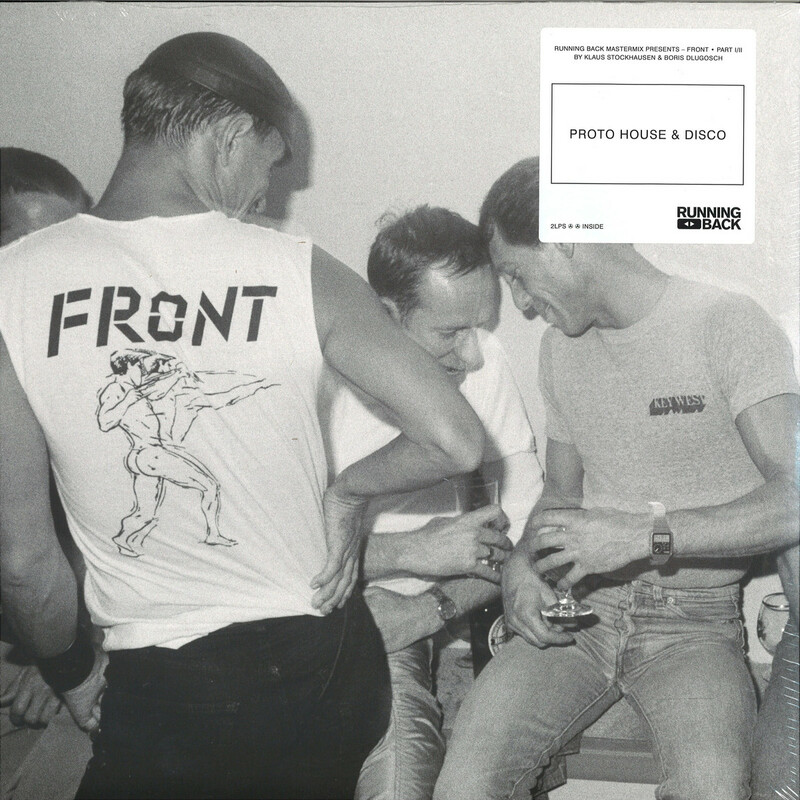 Of course, Front’s sound was finely nuanced. Boris Dlugosch learned his craft from Klaus Stockhausen, who stopped his DJ career in 1992 (because — as he told me in an interview about ten years later — — every Bratwurst wanted to be a DJ all of a sudden’) to pursue a career as fashion editor and stylist. Stockhausen’s thing as a resident (which actually meant to play at ONE club EVERY week during that time), was a mixture between electro, US-American R&B, British street soul, new wave and the emerging house sound. If you manage to dig up old recordings on the internet (a musical diet I lived on for a few years), there are striking similarities to the way classic US-American DJ would play, while adding a fierce uniqueness that won’t let it pale in comparison. On the contrary, the sound of Front is one of the most interesting, you will ever lend your ears, too. So, why a Front mix and compilation 21 years after the club closed its doors On the one hand, because it’s story hasn’t been told yet and it’s worth telling. 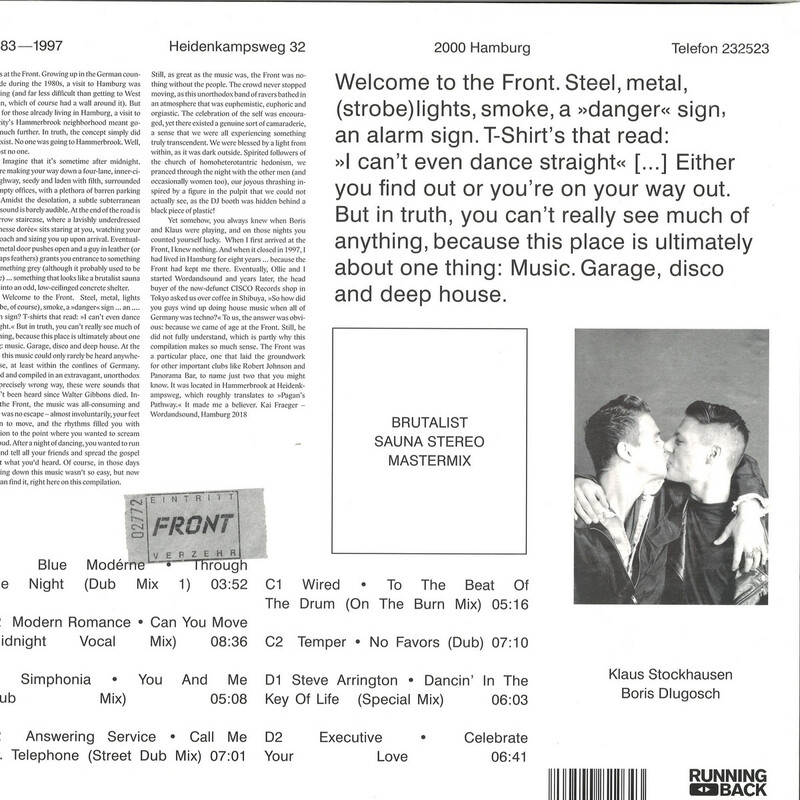 On the other one, German clubs like Robert Johnson or Berghain — as divergent as they might are — both resemblance Front’s spirit, diversity and musical open mindedness. And finally, because dancing is still fun. Even, if putting a compilation like together this took over one year in the making, is peppered with licensing horrors and other obstacles to dreadful to share them here, we are happy to have it done. Spread over a double-CD and two compilation LPs that are mainly chronological, Klaus Stockhausen and Boris Dlugosch picked and mixed some of the club’s most cherished records and sweetest moments. This is the sound of Front. And even, if I was never able to move my feet on its dance floor, I for one would be a very different DJ without it. I hope you enjoy it as much as I do.